A Facebook app organizes your friends via shared interests and experiences. The visualization below comes from the data viz company Meurs. 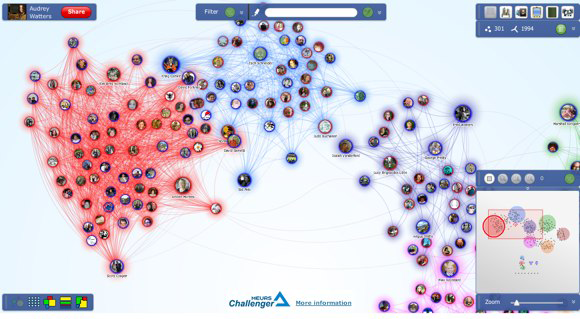 It’s a Facebook app that uses a concept similar to InMaps to visualize your Facebook network. With the app, you can see how your friends are clustered based on education, location, occupation, and so on. You can also view the clusters as arranged by movie, TV, books, and music “likes.” It’s particularly revealing to see which of your Facebook friends are in the Nickelback cluster, or in my case, that none of the people I went to grad school with (for literature, I should add) have “liked” any books on Facebook. This post is part of an ongoing series exploring visualizations. We’re always looking for leads, so please drop a line if there’s a visualization you think we should know about. Article image: Theo van Doesburg, Landscape, 1915, pastel on paper (source: Van Moorsel donation to the Dutch State / Wikimedia).